Grady Greats, a panel focused on the enduring values and power of journalism, was held in New York City on Tuesday, Jan. 22. 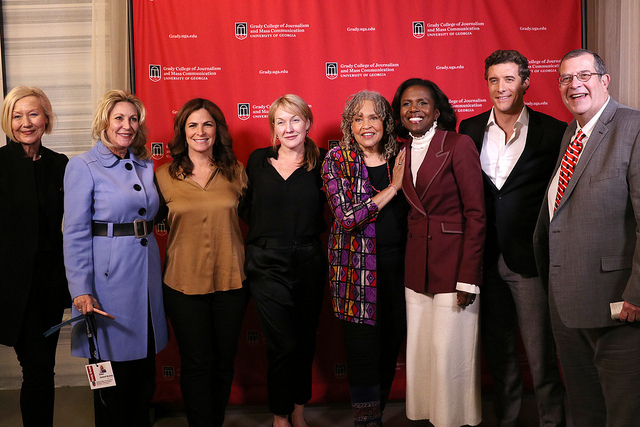 The discussion was moderated by Charlayne Hunter-Gault (ABJ ‘63) and included (from left) Deborah Roberts (ABJ ‘82), Deborah Norville (ABJ ‘79), Lisa Ryan Howard (ABJ ‘92) and Will Carr (ABJ ‘06). A screening of the Grady Greats broadcast will be held at UGA mid-February. Visit Grady Events for an announcement of the date and details coming soon. Discussions ranging from how journalism has changed over the years, to diversity in the industry and the most important journalism skills were featured in a panel of Grady College alumni on Jan. 22, 2019. 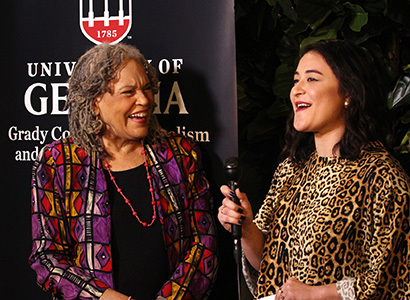 The panel, “Grady Greats: A conversation on the enduring values and power of journalism,” was moderated by author and journalist Charlayne Hunter-Gault (ABJ ’63) and included Deborah Roberts (ABJ ’82), Deborah Norville (ABJ ’79), Lisa Ryan Howard (ABJ ’92) and Will Carr (ABJ ’06). 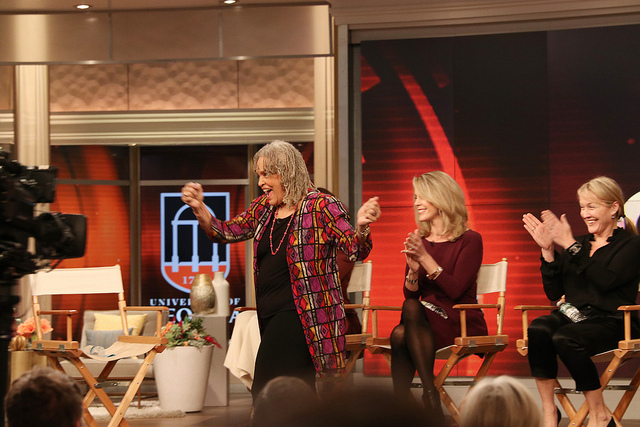 Robin Hommel (ABJ ’96), senior broadcast producer of “The View,” helped coordinate the panel as the executive producer of Grady Greats, with Parker Middleton, Dodie Cantrell-Bickley and the students of DiGammaKappa serving as associate producers. The panelists addressed an audience of Grady College students, alumni and friends in the ABC studios where “The View” is broadcast. Charlayne Hunter-Gault is interviewed by Maddie Ray for Facebook Live before the panel. Most of the topics discussed were directed toward the 17 DGK students. 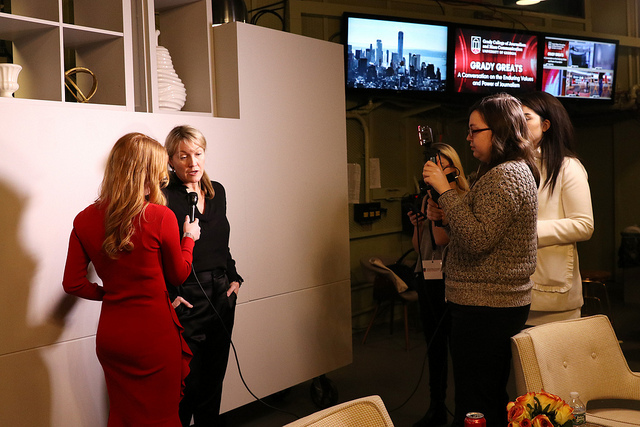 The students had a chance to interview the panelists for a Facebook Live broadcast prior to the show, which was a highlight for some, including Maddie Ray, a fourth-year journalism student. In the panel discussion that followed, several subjects were addressed to provide context and advice for the students and all journalists. Watch for role models: Roberts, a correspondent with ABC News, opened the panel with a word of thanks to Charlayne Hunter-Gault for opening the doors as the first African-American female to take classes at the University of Georgia and then by paving the way for more diversity in the journalism industry. “I am a journalist because I am standing on your shoulders,” Roberts told Hunter-Gault. 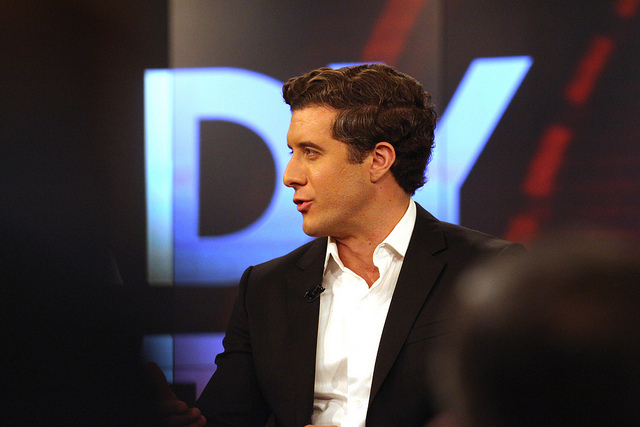 Roberts describes watching the changing face of the network news in the 1970s due to journalists of different ethnicities like Michelle Clark, Lem Tucker and Connie Chung serving as role models. 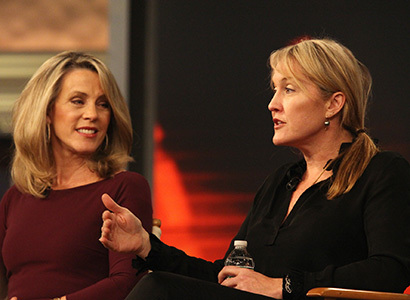 “I began to feel it was possible,” Roberts said of a career in journalism. Deborah Norville looks on as Lisa Ryan Howard talks about the importance of keeping in touch with Grady College. Understanding history is an important part of understanding the world today: Howard considers her role as senior vice president and general manager of media at The New York Times one that enables the hard work that journalists do. Through projects that The New York Times is working on, including its “Overlooked” series looking back and writing obituaries about people who should have had one written in the past, and through a partnership with Google working to digitize historical files for the newspaper, the newspaper is bringing stories back that are resonant with what’s happening today. “You have to push, students”: Hunter-Gault, who practices gentle persuasion, encourages student journalists not to give in to a simple “no” when reporting, as she did when she wanted a story covered that she thought might be turned down. In addition to not giving in, Norville encouraged journalists to stand up to sources wanting to go off the record, and to instead keep comments on the record. Noville agreed, saying that the challenge for journalists is to include source material in the body of stories. Among the advice that Will Carr shared is the importance of delivering news in a charismatic way since many viewers get their news from short clips. Be part of the diversity and inclusion change: Roberts warns that even though there is more evidence of diversity and inclusion in front of the camera, there is still progress to be made with editorial content and planning behind the camera. “I take a certain amount of pride when I’m out reporting because I know I am representing,” Roberts said. “It’s a little frustrating because we don’t see the people who making the big decisions in a diverse way as much as we probably should.” Students need to be aware of that and be part of the change in the future. 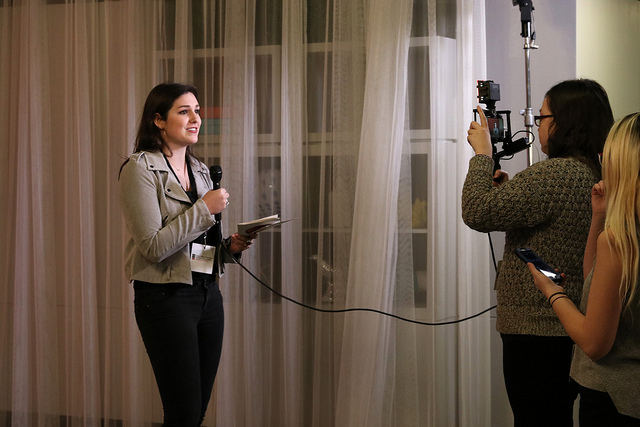 Passion, compassion and organization: when asked what the most important skills today’s multi-media journalists need, the responses were passion for the job, compassion for the subjects of the stories and organization in the manner stories are told. “Before you communicate the story, you’ve got to get the story…and even if you are interviewing someone you don’t necessarily agree with, you have to show compassion to be able to convey a story,” Roberts said. 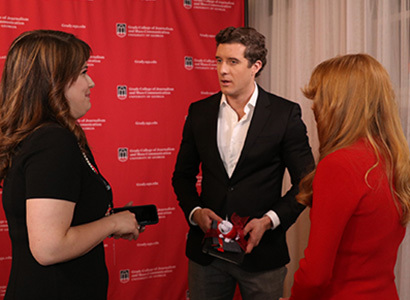 Skylar Nicholson (far left) of DGK interviewed Lisa Ryan Howard for Facebook Live before the panel as Sara Bertolini recorded the discussion. 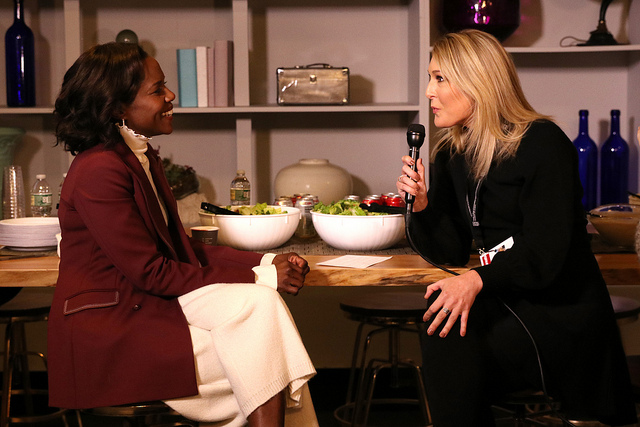 Deborah Roberts was interviewed by Sydney Shadrix of DGK. Erin Valle, president of DGK, hosted the Facebook Live program. Charlayne Hunter-Gault is introduced before the panel discussion. 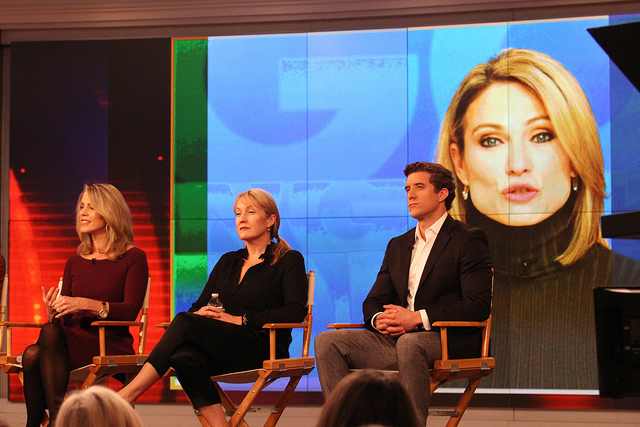 Amy Robach sent video greetings since she was away on assignment. Will Carr makes a point about believing in yourself and going with your gut. 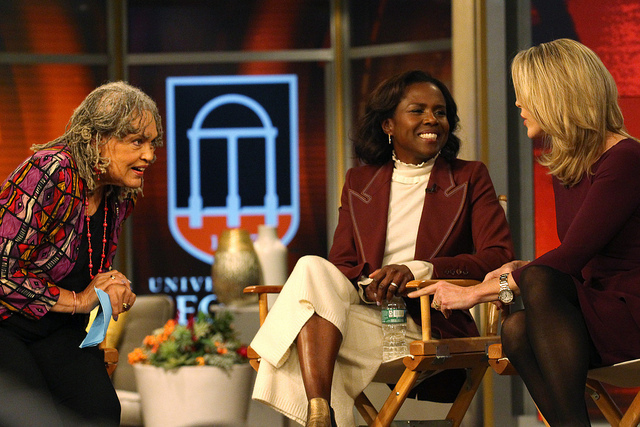 Charlayne Hunter-Gault, Deborah Roberts and Deborah Norville. 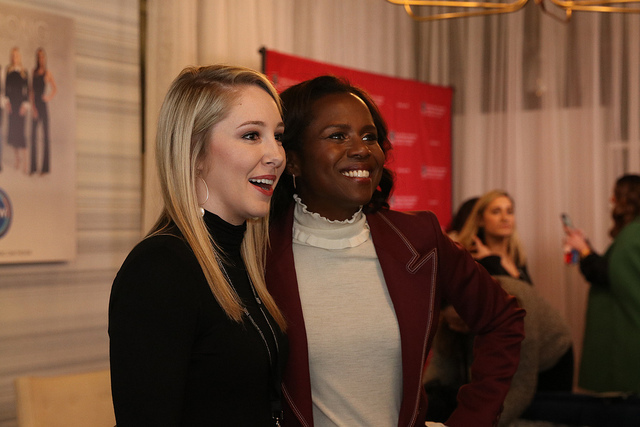 Sarah Hammond, a DGK student, poses for a picture with Deborah Roberts after the panel. The panelists and coordinators of the Grady Greats panel. Pictures from the Grady Greats panel can be viewed on the Grady College Flickr album. 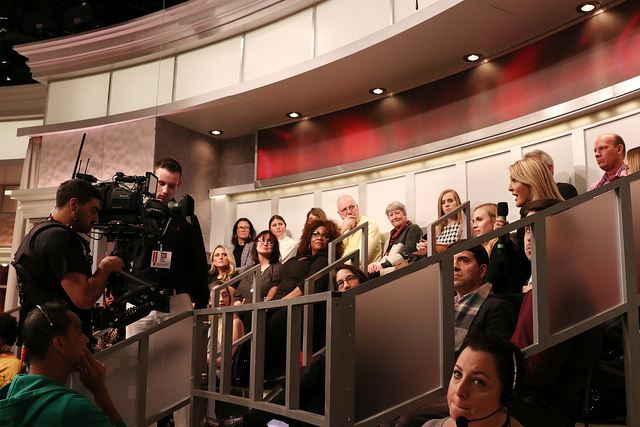 Special thanks to ABC and “The View” for hosting this panel and for their service to journalism. “I feel more than anything else it’s a challenge that we’ve got to step up to. I hate the term, but it puts more pressure on us to just get at the truth and to let our integrity speak louder than ever.” — Deborah Roberts discussing fake news.